On US Route 22 West from the Mundys Corner Exit, travel one mile to Fords Corner Road (TR 424). Travel 1 mile to the intersection of Fords Corner Road and Loraine Road (TR 437). The dirt road leading from that intersection (which is gated off and private property) goes into the woods and leads back to the cemetery. 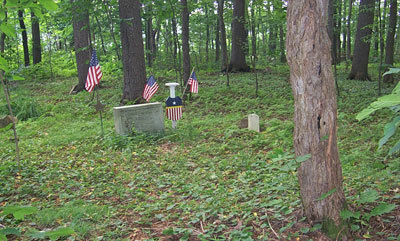 The cemetery is situated at the end of the road on the right side in the woods.